The idea of statistical data analysis has never been more popular, from Nate Silver's book The Signal and the Noise: The Art and Science of Prediction to industry trends such as Big Data. Data itself comes in a vast variety of models, formats, and sources. Users of the R language are familiar with CSV and HDF5 files, ODBC databases, and more. Against this sits Linked Data, based on a graph structure: simple triple statements (entity-attribute-value or EAV) using HTTP URIs to denote and dereference entities, linking pools of data by means of shared data and vocabularies (ontologies). For example, a photography website might use an entity for each photo it hosts, which, when dereferenced, displays a page-impression showcasing the photograph with other metadata surrounding it. This metadata is a blend of the WGS84 geo ontology (for expressing a photo's latitude and longitude) and the EXIF ontology (for expressing its ISO sensitivity). By standardizing on well-known ontologies for expressing these predicates, relationships can be built between diverse fields. For example, UK crime report data can be tied to Ordnance Survey map/gazetteer data; or a BBC service can share the same understanding of a musical genre as Last.FM by standardizing on a term from the MusicBrainz? ontology. The lingua franca of Linked Data is RDF, to express and store the triples, and SPARQL, to query over them. 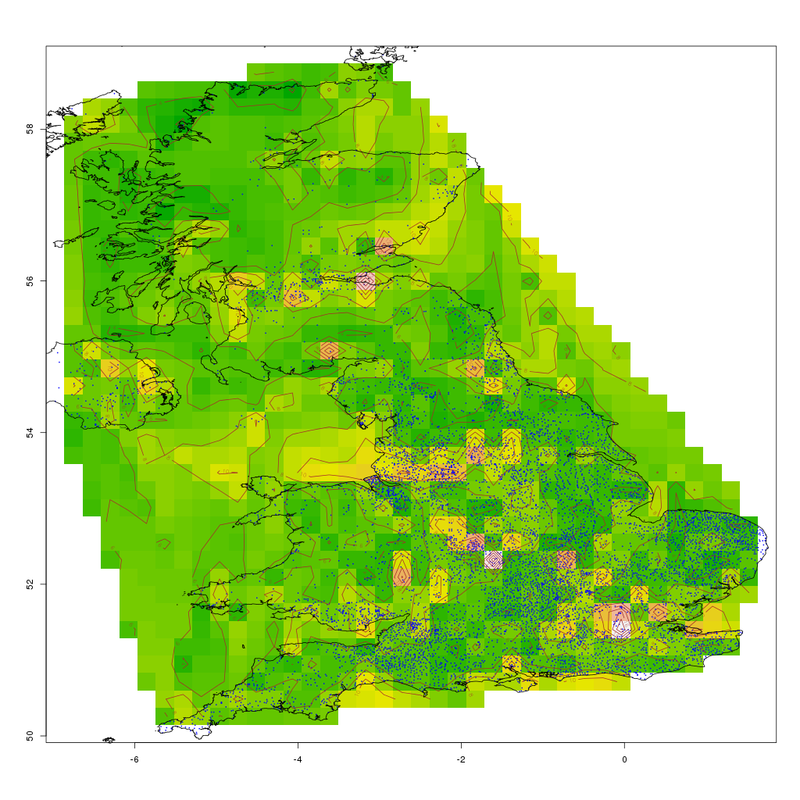 The challenge: to explore the United Kingdom's population density using data from DBpedia. We start by inspecting a well-known data-point, the city of Edinburgh. dbpprop:title - a CURIE, identifying the title attribute within the dbpprod namespace (http://dbpedia.org/property/), thereby assigning a title ("The City of Edinburgh"). Again, we do not need to know the type of the entity; that it has a latitude and longitude is sufficient. So far, we have some rudimentary filters we can apply to dbpedia: to make a table of latitude, longitude, and corresponding population. However, on executing this against the DBpedia SPARQL endpoint, we see some strange "noise" points. Some of these might be erroneous (Wikipedia being human-curated), but some of them arise from political arrangements such as the remains of the British Empire ? for example, Adamstown in the Pitcairn Islands (a British Overseas Territory, way out in the Pacific Ocean). Hence, to make plotting the map easier, the data is further filtered by latitude and longitude to points within a crude rectangle surrounding all the UK mainland. The GADM database of Global Administrative Areas site has free maps of country outlines available for download as Shapefiles, ESRI, KMZ, or R native. In this case, we download a Shapefile, unpack the zip archive, and move the file GBR_adm0.shp into the working directory. The maptools library allows us to load a Shapefile into an R data frame; akima provides an interpolation function; and SPARQL provides the interface for executing queries. After a few seconds to load and execute the query, you should see a map showing the outline of the UK (including a bit of Northern Ireland) with green/yellow heat-map and contour lines of the population density. Individual data-points are plotted using small blue dots. This is a rather na?ve plot: interpolation is not aware of water, so interpolates between Stranraer and Belfast regardless of the Irish Sea in the way; however, it looks reasonable on land, with higher values over large centers of population such as London, the Midlands, and the central belt in Scotland (from Edinburgh to Stirling to Glasgow). This shows a very slight correlation of population-density with longitude, and about twice as much correlation with latitude, but neither is statistically significant in the given data (as the p value should be less than 0.01, not up around 0.5-0.8). SPARQL has a SERVICE keyword that allows federation, i.e., the execution of queries against multiple SPARQL endpoints, joining disparate data by common variables (a/k/a SPARQL-FED). For example, it should be possible to enrich the data by blending Geonames and the Ordnance Survey gazetteer in the query. Over to you to explore the data some more!